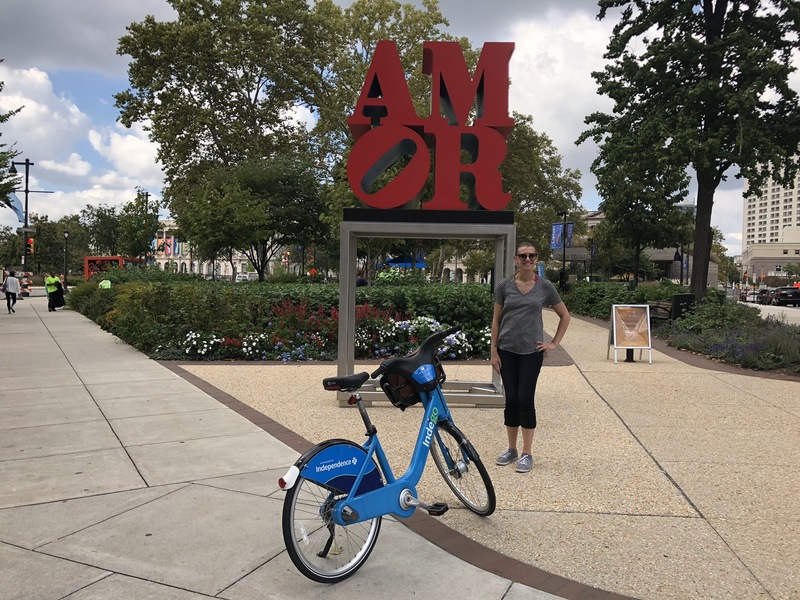 I made a stop in the Philadelphia during my recent East Coast trip and got to try out Indego, their bikesharing program. I downloaded the Indego app before arriving in the City of Brotherly Love. The app looked great! It clearly showed all of the bike hubs, and also indicated how many bikes and available parking spots were available. There were several near the 30th Street Station, so I checked my luggage with Amtrak and decided to bike to the sites. I was able to pay at a kiosk at a nearby bike hub. According to the app, a one day pass for Indego is $10 for one day with unlimited 30 minute trips. The screen was difficult to read and wasn’t the easiest to use. I had to enter the bike number I wanted to use, and the kiosk informed me I had 30 seconds to remove it from the dock. What’s with the pressure, Indego? I would have preferred to have a moment to put my wallet back in my purse and adjust the bike seat before the clock started on my reservation. I felt a bit intimidated by the vehicle traffic and lack of other cyclists on Market Street as I biked toward the Liberty Bell and Independence Hall, but I was pleasantly surprised by Philadelphia drivers. Nobody honked or yelled at me for being in their way. Drivers graciously gave me the right of way as I made my way through the roundabout at Logan Square, down Benjamin Franklin Parkway, and on Race Street through Chinatown. 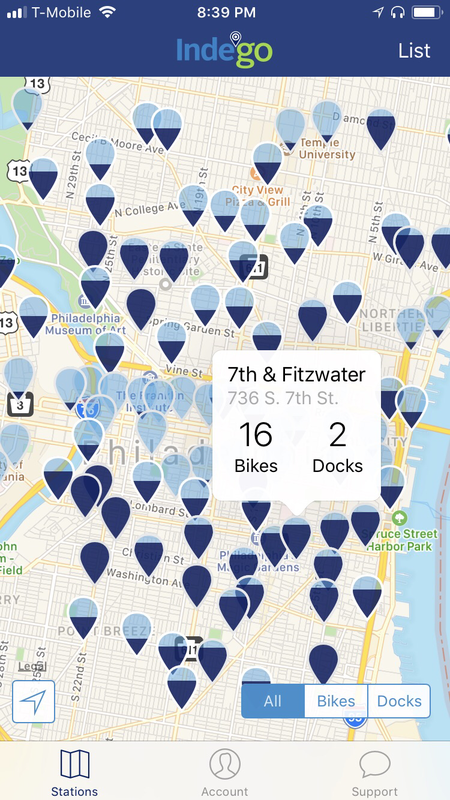 I checked the Indego App, and most of the bike hubs near the Liberty Bell were full. Darn. I finally found one south of Independence Hall which showed to have a few open bike docks. It was out of the way, but I didn’t want to be stuck with this bike any longer. I made my way to the allegedly available dock, but even that was full! I had to continue circling around the area until I found a bike hub that was available. I had limited time in Philadelphia, so I wasn’t too thrilled that I had to waste my time looking for a place to put the bike. Plus, Indego charges based on time, so I had to pay for that time spent looking for an available dock. After I saw Independence Hall and the Liberty Bell, my next tourist destination was the Rocky Steps (after all, I did get my name from that movie!). I was so frustrated from my experience with the Indego that I decided to save my time and call a Lyft. And good thing, too! There is only one bike hub near the Museum of Art, so I would have been doomed if it was full. Thanks for the Brotherly Love, Philly. Your people are no-nonsense and hospitable, but please work out the kinks with your bikesharing system.